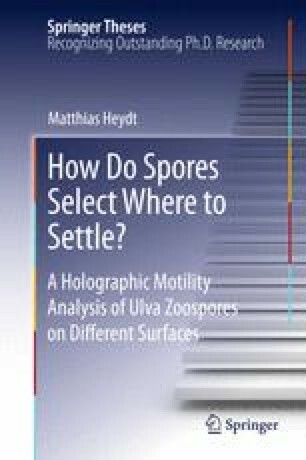 How Do Spores Select Where to Settle? The aim of this thesis is to study the exploration behavior of microorganisms and to correlate the observed behavior with the known antifouling performance of surfaces. In the following, the existing knowledge in literature important for the scope of this thesis is reviewed. First, the used organism is described followed by a detailed description of surface cues altering the observed settlement. Afterwards the general swimming properties of microorganisms are explained in detail. Finally the results of this thesis are compared to other 3D motion studies published in literature.